Sunset Boulevard is coming to Chicago - March 28 to June 7, 1997. Click here to order tickets now! 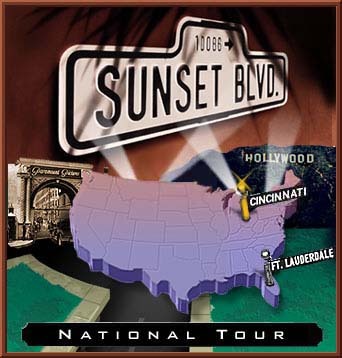 Over the next three years, the First National Tour will be traveling the country bringing the magic of Andrew Lloyd Webber's Sunset Boulevard to you. Take a look at our short introductory movie (2.0MB Quicktime or AVI ) and the Andrew Lloyd Webber education movie(4.3MB QuickTime), which can be downloaded and played by any QuickTime-compatible multimedia player. Join us for a multimedia preview of the story, a look at the music and cast, and a study of the making of the musical. In addition, get in depth information about the touring cities, including ticket and theatre information. Feel free to see all of our multimedia content in the Multimedia Gallery. Give us your opinion on the show and any other feedback in The Forum. Join us in getting "Mad about the site." For more information on Sunset Boulevard and any other Andrew Lloyd Webber musical, please visit The Really Useful Company Website. The Really Useful Company, Inc., © 1996. Please report any problems to the Webmaster. Produced by T3 Media, Inc. Last Updated: April 27, 1996.